WPF’s PrintDialog has a UserPageRangeEnabled-Property. Set this property to true before you show the PrintDialog. Then the user is allowed to enter a Pagerange in the PrintDialog. The problem is that whatever the user enters, in each case all pages are printed. 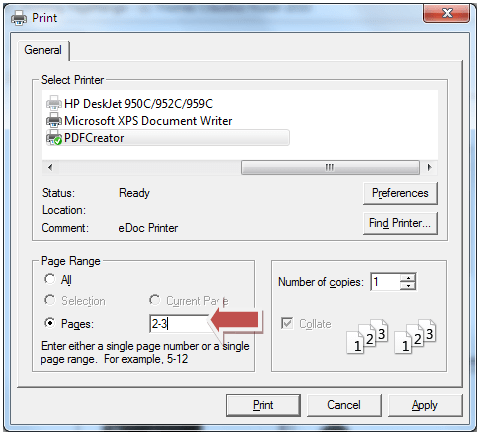 The PrintDialog itself has no logic to print some specific pages. Let’s look at an example. 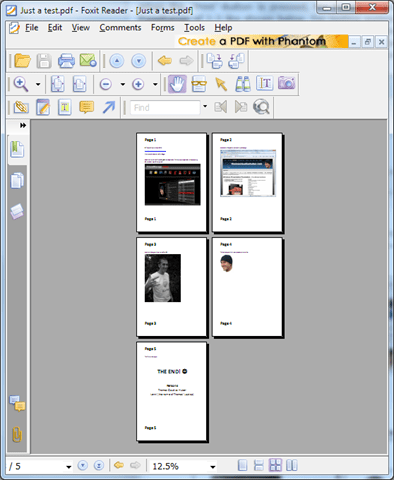 Below the small UI that consists of a Button and a DocumentViewer. This code belongs to the MainWindow.xaml-File. The Codebehind-File MainWindow.xaml.cs has an EventHandler for the Loaded-Event of the Window. There a XPS-Document with five pages is loaded into memory. The FixedDocument-Instance contained in that XPS-Document is stored in the _fixedDocument-Field and displayed in the DocumentViewer called viewer – the latter we declared above in XAML. So we have the necessary thing for testing a “print-range”-scenario: A FixedDocument-Instance in memory, stored in the _fixedDocument-Field. Let’s look at the PrintButtonClick-Eventhandler that contains the logic to print. The Eventhandler is shown below. First a PrintDialog is created. Then we set the UserPageRangeEnabled-Property to true, show the Dialog by calling the ShowDialog-Method. Is the return-value true we call the PrintDialog’s PrintDocument-Method by passing in the DocumentPaginator of the FixedDocument. Also a string is passed in that is displayed in the printer queue as jobname. When the “Print”-Button is pressed, the PrintDialog comes up. I select a PageRange of 2-3 like shown below. 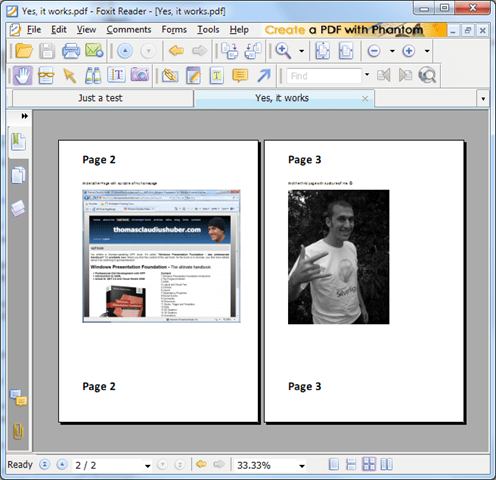 For testing purposes I always print in the PDFCreator that creates a PDF-Document with the output. There are several other ways. You could also print in the XPS-Document-Writer (even if it’s a little bit doubled when printing a xps to the XPS-Document-Writer). 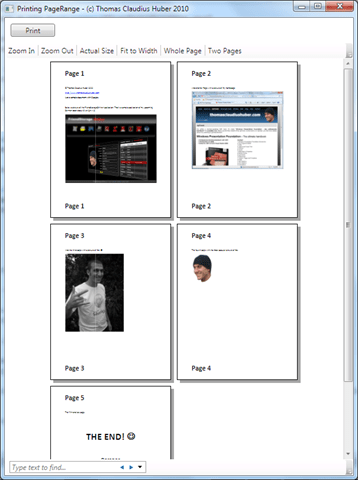 Now even with the Pages of 2-3 selected, the “printed” PDF looks like below. It contains all five pages of my document. But it should contain only the pages 2 and 3. So let’s summarize the problem: It doesn’t matter what you select as a PageRange in the PrintDialogs Pages-Field. It’s up to you to check the Pages and print out only that range. The PrintDialog doesn’t care anything about the PageRange. In my mind creating a new XPS-Document just for printing is a bad solution. I think a good solution would be to just be able to print some pages of an existing xps-Document/FixedDocument. So let’s look at the good one. The good solution is the one I’ve implemented today and finished in the train from Zurich to Basel. I’ve not tested every scenario, but it seems to work great. If you have any hints to this solution, let me know. The first thing you have to know is that the pages used for the output are created by a DocumentPaginator. This was passed to the PrintDocument-Method of the PrintDialog some lines above. The DocumentPaginator-class itself is abstract. Beside some members it defines a Method GetPage(int pageNumber) that returns the DocumentPage for the passed in pageNumber. Now the idea is to create a wrapper-class for the DocumentPaginator that is itself also of type DocumentPaginator. And now guys, what pattern is that? ;-) Doesn’t matter. So we create a DocumentPaginator and let’s call it PageRangeDocumentPaginator. It encapsulates a DocumentPaginator and can return a specific (page)range of the encapsulated DocumentPaginator. Therefore the constructor takes two parameters: a DocumentPaginator to encapsulate and a PageRange-object that contains PageFrom and PageTo-Properties, both of type int. The PageRange-structure exists in the Namespace System.Windows.Controls. The PageRangeDocumentPaginator-class is listed below. In the constructor the passed in DocumentPaginator is stored in the _paginator-field. The pageRange-values are stored in the fields _startIndex and _endIndex. As the PageRange starts with 1, we substract 1 to get the zero-based index. In the final line of the constructor the _endIndex is adjusted. If the user enters a higher pageNumber than the Document contains, _endIndex will point to the index of the last page. Now look at the override of the GetPage-Method. There gets just the GetPage-Method of the encapsulated DocumentPaginator called. But the _startIndex is regarded. Now look at the PageCount-Property. It uses the _startIndex and _endIndex to calculate the pageNumbers. IsPageCountValid always returns true and the Properties PageSize and Source simply pass the responsibility to the underlying DocumentPaginator. That’s it. Now look how to use the class in the PrintButtonClick-Eventhandler. // paginator by using the "startIndex"
The exception throwns where i using XPS Printer on Windows XP or Windows 7. Same error with all of my printers. P.s: PDF print not tested. Thanks for the code – we are currently using this and works just fine with XpsDocumentWriter.Write method. However, it fails when we use the WriteAsync method. Have you tried Async printing with this? For the mentioned problem in the comments I suggested a solution on http://social.msdn.microsoft.com/Forums/en-US/wpf/thread/841e804b-9130-4476-8709-0d2854c11582/. If you’ve found a problem with this solution please report it over there. By the way thank you Thomas for your great and simple solution for this PageRange problem.